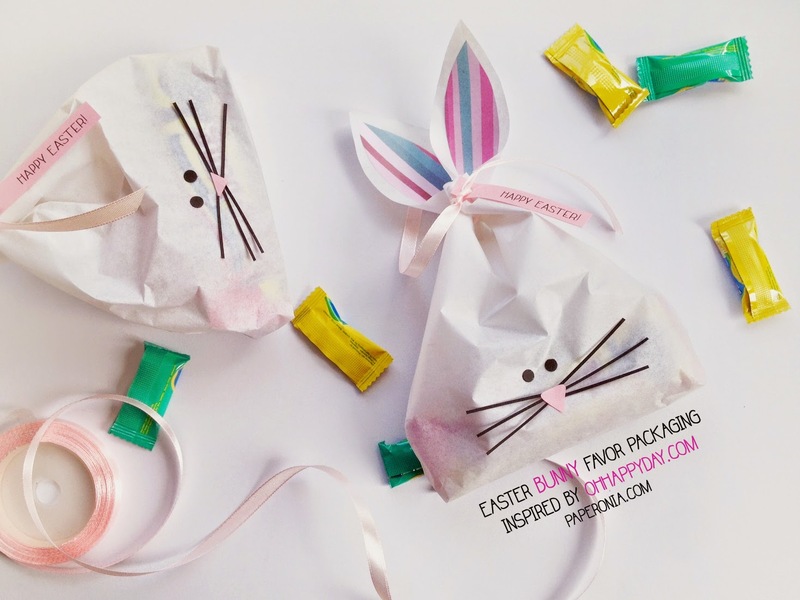 I found this great idea for Easter favor packaging on Oh Happy Day which actually was very simple and would require little work and time to do. But as I was sharing this project with my Ma, she said she would like it better if it was more bunny-apparent and looked more cutesy. I went ahead and started by doing the exact ones like shown Oh Happy Day, except that I did not and still do not own "double-layered glassine bags" so I had to make the bags from scratch using parchment/baking papers. What I eventually did differently after trial and errors were a) the ears which I cut from patterned origami papers instead of vellum papers (so many fancy things I do not own haha), and I glued the pink ears before tying the ribbon, worked a lot easier than doing it after the paper bag is all crunched up, and b) the final step was adding a pair of eyes (by punching holes on black paper), tiny triangular pink nose and strips of thin black scraps for the whiskers. This last step actually took me the same amount of time doing all of the other previous steps. I guess because cutting and pasting tiny and delicate things were required. It was worth it, though. They came out very cute. Can't wait to give some to my nephew and niece!